When it comes to caring for a child’s teeth, parents hold the complete responsibility until a child is old enough to do it himself/herself. For many parents, they are unaware of how early this importance begins. Once a child’s teeth begin to emerge inside the mouth, they need to be cared for just like adult teeth. That means that as early as 4-6 months when the first baby tooth erupts inside the mouth that parents need to be brushing their child’s teeth. Tooth decay is the leading chronic childhood illness in America, yet it is entirely preventable. The teeth must be cared for diligently in order to prevent the damaging effects of plaque. Plaque is caused by the chemical reaction between bacteria and particles left behind in the mouth after eating or drinking anything other than water. Because babies are fed milk (breast milk or formula) and as soon as they begin eating baby foods, their teeth are constantly assaulted by plaque. Plaque is made up of millions of acid-producing bacteria, and it spreads throughout the mouth each day. All teeth need to be brushed at least twice a day and flossed daily in order to remain healthy and free from the damaging effects of dental plaque. Parents need to begin caring for their child’s teeth as soon as they erupt inside the mouth. From 6-months of age to 3-years, a smear of fluoride toothpaste should be used with a child-sized toothbrush. As the child ages, a pea-sized amount of fluoride toothpaste should be used. Just as with adult teeth, the child’s teeth should be brushed in the morning and at bedtime, with no other foods or beverages given unless the teeth will be brushed again. It is essential that a child go to bed with clean teeth so that the teeth are not constantly under assault from damaging plaque throughout the night. As children grow and mature, they will need to learn to care for their own teeth. 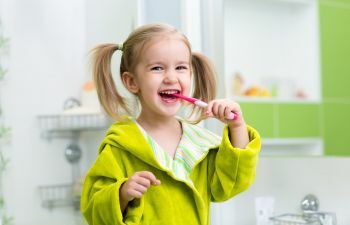 While parents are the best sources of good examples for proper oral hygiene, children should be supervised until they are capable of taking care of their teeth. Children can often be encouraged to brush properly with fun apps from Disney® and other child-friendly sources that are easily incorporated into your tooth brushing ritual. At Gold Hill Dentistry, we want to encourage you to bring your child in early for his or her first dental appointment. We want to partner with you as a family to promote, achieve, and maintain optimal oral health. Call us today.